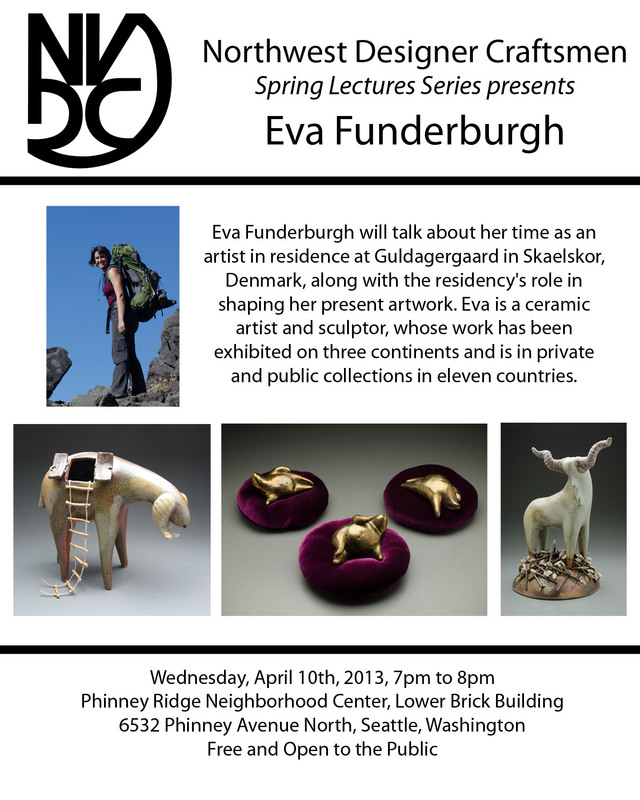 I’m going to be doing a lecture this Wednesday through the Northwest Designer Craftsmen. I’m super excited about it. It’s going to be in the lower building of the Phinney Ridge neighborhood center, from 7 to 8pm. Directions can be found here. 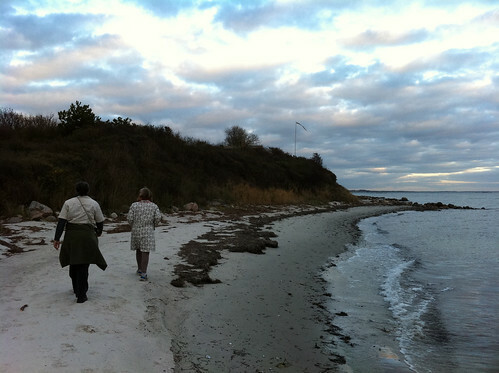 My plan is to talk about my residency in Denmark, and how that’s inspired and shaped my present work. There’ll be snacks and coffee, and it should be a good time. Installing “Swarm” was a really fun process, one that got me thinking much more about installation, public art, and audience interaction. I have to admit, however, I wasn’t expect to be getting as much out of its dispersal as I have been. I’d always planned to give away many of the fliers before I left Guldagergaard. When ever I work on a project with multiple bits, I often give parts away. Most often I’ll make many tiny eggs, giving them to fellow woodfirers, other artists, friends, visitors to the studio, all sorts of folks. I just enjoy something about the exchange of physical object that become representations of memory. Like something that might be lost for a year in the pocket of a winter coat, only to be found again like a prize, refound with either a rush of memories or wonder of how that could be there. So with that in mind, I’ve been giving away fliers, to the artists who shaped my time at Guldagergaard, to fellow studio mates, and good friends. I’ve been selling them as well, through my studio, the Island Gallery on Bainbridge, and through Etsy. It’s been so cool, watching them go on to new lives. It’s amazing to me to see something made by my hands disperse and bring happiness all over. On a whim, I made a google map of all the place they’ve gone. It’s made my day, and it will just continue to be exciting as it keeps filling in with new locations! I kept procrastinating on writing up an overall summary of my time a Guldagergaard. I wrote a draft during my last week there, only to decide that it was totally inadequate at capturing even part of my experience. Since then, I’ve spent a week sight seeing in Denmark, returned home, and tackled nearly everything I could think of that wasn’t working on the blog. At this point, I’ve run out of other errands to do and have decided, that regardless of how awkward or incomplete it might feel, it’s worth trying to really sum up everything and think about my time at Guldagergaard. The reason I started looking for a residency in the first place was I felt I needed a push. I wasn’t in a rut, but I felt like I could see the start of one. I enjoy my critters, but I wanted to understand them more, to figure out how to make them better, and how to push myself further as an artist. In short, I’d reached a point where felt my work was in need of some growth. I figured the best way to go about this was to apply for a residency. I want to put myself in different surroundings, in a different culture as a method of shaking myself out of my habits. 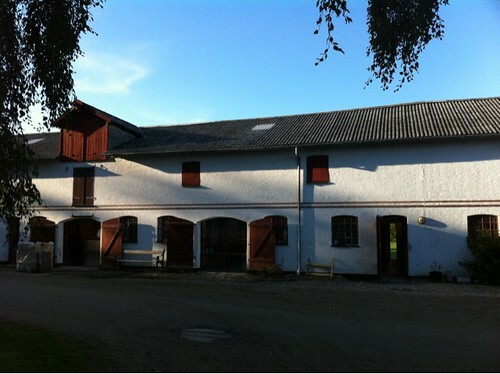 After some research, I decided to apply to Guldagergaard in Denmark, a place I’d first heard about a few years back. I spent a while thinking about a how to structure my residency, and looking for a project to focus. While artist growth was my overall goal, I work best with hard deadlines. I decided to finally tackle an idea that had been kicking around in my head for a while. I wanted to tie my present small monsters back in with earlier college work in installation, creating a giant swarm of beasts. I proposed making as many tiny flying beasts as I could in my time there, turning the pieces from individuals into one giant mass, an exploration of movement, numbers, and space. In the end, Guldagergaard decided to accept my application and project proposal. I packed my bags and headed off into the land of tasty pastries, wind power, and unpronounceable words. Guldagergaard has wonderful facilities. It has an excellent collection of kilns and work areas, not to mention it’s permanent collection of sculptures or it’s library of ceramic literature. 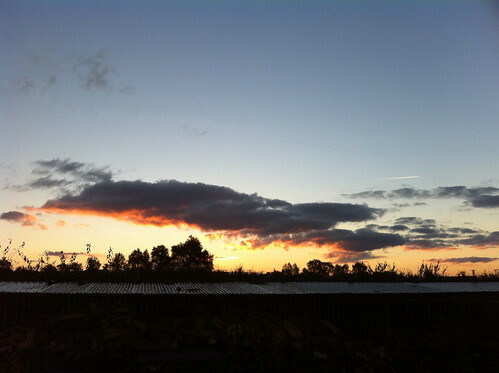 Its location in a sculpture park is idyllic, perfect for wandering and musing. I would walk to the top a large earthworks piece with a thermos of tea and a sketchbook almost every sunny day. However, none of those are what makes Guldagergaard work – Guldagergaard works because of the people. We averaged about 7 guest artist and artists in residence during my time there, in addition to some wonderful administrative and technical staff. This means you’re constantly working with new people with wonderfully new ideas. Almost every week, someone would head back home and someone else would arrive. With them, they’d bring a different approach to ceramics. It was amazing to see so many different approaches and philosophizes about clay, and to work with so many different artists. Every night we’d sit down a communal dinner, cooked by a different artist, and talk about about everything from art to knock knock jokes. In the end, while I definitely found my artistic growth and new sources of inspirations, also I feel like my original installation proposal worked out even better than I could have hoped. It was my first time making such a large piece with so many parts. I typically just make one beast at a time, and move on to the next. This was a very different experience, to say the least. I was very sick of making fliers at points, to say the least. I ended up making about ninety fliers, each one hand made and unique. (The idea of casting them just didn’t feel right, though it would have been faster). I made them all in about two and a half weeks, using a week and a half the fire and install them. 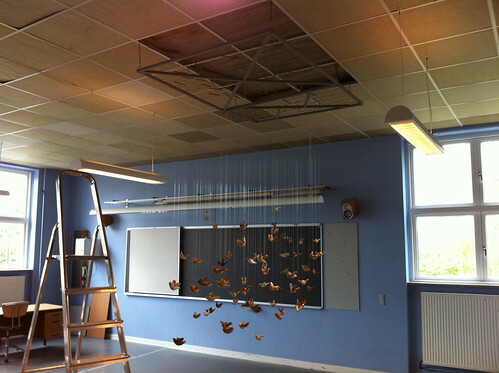 Mette, one of the administrators, talked to a local elementary school and arranged for me to temporarily install my piece in an unused classroom. This was a brainstorm for which I’m incredibly grateful. I’d never worked with kids, and never done anything even resembling public art before. Even entering the school was strange for me. I don’t think I’d been in an elementary school since 6th grade, and I kept expecting someone to call me out on being in the hall between classes. It was even stranger once I went and hung out in the teachers lounge, and realized that some were no older than me. Weird deja vu aside, it was fascinating to see the piece come together, as I hung each beast from the framework. I had expected the increase in numbers to turn the fliers intimidating. Surely, when confronted with a person-sized mass of tiny beasts with teeth, a viewer must feel some level of threat. However, the opposite effect occurred. Instead of amplifying their slight menace, the increase in numbers amplified their joy. 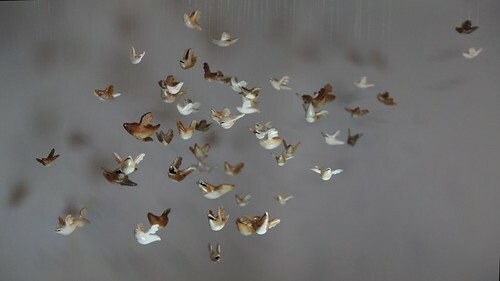 Each one demonstrated pure joy in movement and flight, while being frozen mid flap in a massive and likewise frozen mob. It was fascinating. I can’t wait to try and make an even larger one. Likewise, creating an installation in a public space was also new and very exciting for me. After the work was finished, I got to talk with several of the older classes of English students and let them check out the piece. The only real interaction my work has had with the public before this has been the occasional art opening. Sure, that’s the public, but it’s the art viewing public. These were a bunch of Danish 12 to 14 year olds just trying to go through their school day – and it made them smile. I’ve always appreciated it when my work could make other people smile. This was new, and more powerful version of that. It’s made me think more about public art, installation and all sorts of crazy things for the future. And I think that in all, that’s one of the most exciting things about my time in Denmark. The past week has been an odd mix of very busy and very relaxed. We finished the soda firing last Friday, and I spent the weekend relaxing and starting some preliminary work on the installation frame. However, as soon as Monday came, life kicked up into full speed once again. 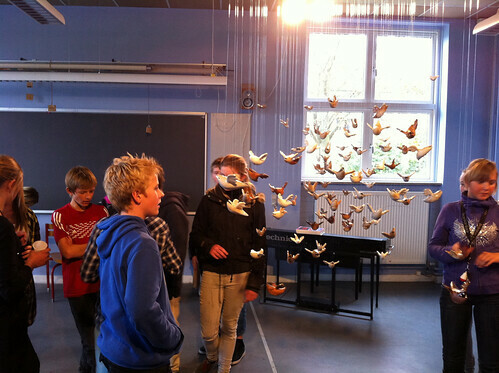 Mette, the wonderful director here at GG, has arranged it so I could install “Swarm” temporarily in a local elementary school. We met with a school official Monday morning, who asked when I could start installing it. 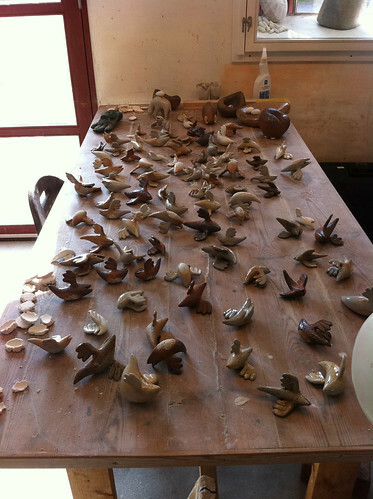 Despite the fact that the pieces were all still in the kiln at the time and the framework was barely started, I decided to be optimistic and said I could start on Wednesday. This was setting myself up for a lot of work in a short period of time, but then again, that’s what I’m here in Denmark to do! 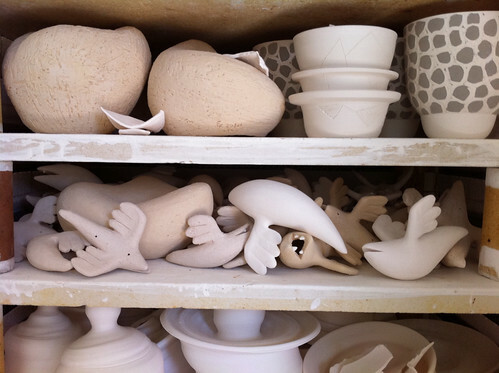 As soon as I got back from the school, it was time to get the kiln unloaded and get myself to work. While I was fairly happy with how my work came out, but it turned out the soda firing held some surprises. The main one was the way that Jody’s work reacted to the firing. 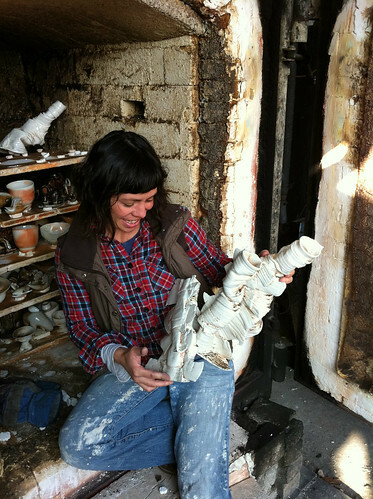 Her work is made of thrown porcelain which has been cut apart, manipulated, and reassembled. 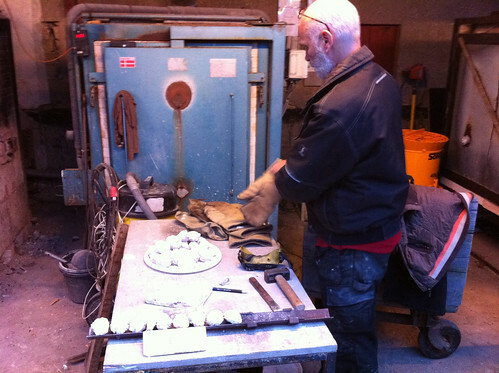 While it’s visually all about movement, we weren’t expecting the fact that the pieces themselves moved a huge amount during the firing! Every nearly single piece warped, fell or tilted. 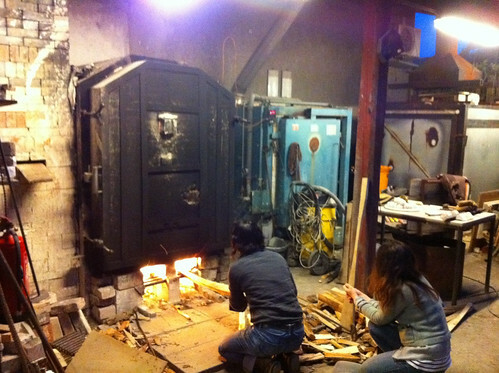 The mystery of the overly long and difficult firing was solved when we discovered that two to three pieces of hers had fallen into the firebox, blocking off most of the path of the flame into the kiln. 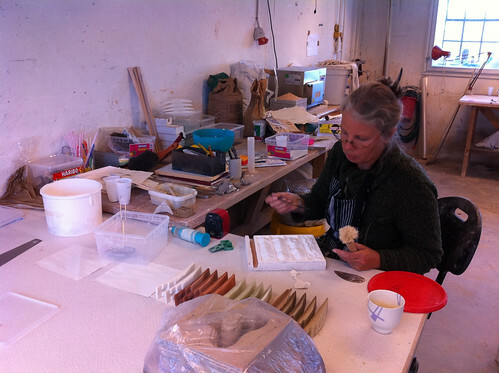 In the end though, she seemed ok with some of her results, and started to get excited about some of the new creations that formed as a result of the firing. On my part, I didn’t loose a single piece, which is a very luck situation. Overall, while I’m still not sure soda firing is really for me I’m still quite happy with the results of this firing. It seemed to have work especially well with Swarm. Anyway, as soon as my pieces were out of the kiln, I got to work on the installation framework. It was my plan to make a wooden frame containing a metal grid. Each flier would be hung from parallel strands of fishing line, which would run up to a stick that’s a bit longer that the mesh work of the grid. That way, hanging each flier from the grid would be as simple as slotting the stick through the grid and letting it catch, like a button on a coat. While this worked as well as I hoped it would, the frame and hangers took no less that five trips to the hardware store along with many many hours of very hard work. I also totally owe my friend Rachel Van Wagoner who spent several hours helping me string fliers on fishing line. However, in the end, everything came together for Swarm. I’m extremely happy with how it’s worked out. It’s taken weeks of hard work and hours spent walking up and down a ladder, but I think it’s all worth it. This idea of thing hanging together in space is one that I keep coming back to, much like my city beasts. In fact, my parents recently reminded me of a ninth or tenth grade math project, where I tried to build a three dimensional diagram of the golden spiral using ping pong balls and fishing line inside a plexiglas cube. The end result was giant, clunky, and awful looking, but evidently planted some thoughts about space and sculpture that have stayed with me to this day. It’s wonderful to finally have created something that properly explores those ideas. Here’s a brief video tour I made of it. The video accidentally got shortened by flickr, but I’ll be making a longer one with proper lighting soon. Tomorrow I’ll be heading back to the school for an opening reception, complete with snacks, tours by some of the older students, and music sung by the students in the grand tradition of Danish fantasy ballads! It also apparently will include a speech, by me, to the students. I better go figure out what I’m going to say and see if I can finally manage to pronounce Guldagergaard in such a way that it doesn’t cause all Danes in the vicinity to burst into laughter.